If words like “C++”, “12 inch rotary debugger”, “dangling pointers” (phhwwoooarr! ), “caffeine drip” and “early grey hair” are baffling, confusing or frightening to you, it’s probably best that you skip this post. It’s all technical, boring and generally an opportunity for me to document a mistake that I’ve made in the hope that writing about it will embed it so far in my brain that I will never make it again. C++ is a cracking computer language with a simple philosophy: it’s all YOUR problem. Allocation of memory? Your problem. Freeing resources? Your problem. Knowing what everything is, where everything is and what state it is in? Your problem. C++ and its cousins, C and Objective C, are relatively straightfoward because they do nothing behind your back. They’re completely faithful. Indeed, you could send student C++ out for the evening wearing a shockingly short skirt to get completely plastered and be 100% sure that she’d behave like the perfect lady. For high-performance, real-time simulation software, games, firmware and an endless bundle of other things it’s a fastastic choice – there’s nothing sneaky going on and you’re in complete control. The down side, though, is that you have to remember to handle the whole caboodle yourself. Memory management, pointers to objects, etc., all become the programmer’s problem. This can be great, as everything behaves logically and as it should, but it is also an incredible source of bugs and issues for novice and experienced programmers alike. Those that have been doing it for a fair while develop strategies to avoid making common errors and build libraries of their own to help ensure that some of the lowest level crapola can be farmed off to well tried and tested code. Some of my list, for example, you can find here. And then there’s STL – the Standard Template Library. It’s part of the C++ standard and it adds some truly fantastic higher-level functionality to C++: the kind of functionality that users of almost all other computer languages (except, perhaps, CECIL and assembly language) take for granted. With this handy help, though, comes a cost. C++: never does anything behind your back, or indeed, anything at all unless you command it. STL, though, does all sorts of things without you knowing but is better at parties and drinks like a fish. STL is like C++’s naughty cousin. You can rest assured that if C++ comes home in a police car or ends up in hospital, it’s STL’s fault. She’s the sort of person that is a walking temptation machine: “Here, C++, try these pills, they’ll make you feel great!”.The reason for this is quite simple: STL does do things behind your back in the name of giving you a hand: “Here, I’ll hold the door open for you.” strollstrollstroll “That’ll be a dollar”. … and pop! The first one has gone (the experienced STL users are currently frothing and steaming saying “hey, you should be using a deque for that, because vectors are designed for adding and removing at the end only, doofus”. I know, but one likes to keep examples simple without having to introduce the whole of STL, so forgive me. uint16_t		age;	      // Age can't be negative.. or CAN IT? Even if you’re not a programmer, hopefully you can get the gist of that. We end up with a vector containing four objects for four people: Rattlesnake, The Germs, Irregular Pigeon and the Giraffe Gamily. So much wonderful stuff that would normally be your problem has been handled by the vector: it has allocated the memory for you, it has copied the objects across, it has resized itself when it ran out of room… oh, the joy! The joy. Danger! Danger! Danger! Wooo-woooo-woooo-woooo! Frankly, if I was doing something like this, alarm bells should have gone off like mad but I had a special case (aren’t they all?) and it was a really, really good way of getting around the problem I had: many objects of different types, all of which inherited a serialisation base class, all of which needed to be serialised… so, after creating all the objects (which were constant, created once at load time and they never changed after that) I simply dumped pointers to them (pointers are the ‘address of’ an object) onto another vector. Then, when it came to data-save-time, I could whizz through the whole lot dead quick and serialise ’em. And, do you know what, I would have got away with it, too, if it wasn’t for for the unchangable changing. When you write an application which has a long life-span (many releases over many years) then eventually, regardless of any clairvoyant planning, it will end up doing things that you never imagined. In my case, the bold bit a couple of paragraphs up changed. I had a new feature and it would save me an enormous amount of time if I just inherited an existing object, made a couple of changes to it through overloading and then dumped it onto the array of that object type. Bingo, it all worked fine. Then I had a crash. That’s odd, it was in the serialisation code. I’d not touched the serialisation code in months so what the flying flock of pigeons was going on? Ok, tried a different configuration file (this particular application changes into different applications depending on its configuration – it’s a doppelapplicationgänger) and it worked OK. Right, back to the configuration I was working on, all seems OK… can’t have fixed itself, but I figured I’d wait until the next crash. The data was inconclusive last time (by inconclusive, I mean “I refused to believe it”). Ah yes, crash number 2. Ok, breakpoints and started stepping through the serialisation code. For some odd reason, one of the objects that was being written was corrupted. So I looked at the list of objects: they were all fine, but the one that was on the serialisation list wasn’t there. How’s that possible? I put the pointer to it on at load-time, I don’t remove anything from the main object list so how could that pointer become invalid? Honestly, what blog would be complete without this classic Internet picture? And then I remembered why I had copy constructors: to control how the objects copy themselves when the vector reallocates its memory. 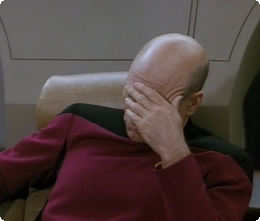 This was the Picard face-palm moment: adding the object had exceeded the memory that the vector had allocated so it did its groovy magic behind the scenes: it allocated new memory, copied everything across and continued. This, of course, meant that there was a shiny new set of clones all at new memory locations. My pointers to the objects were pointing to the old objects. The ones that were not there any more. Dangling pointers to random rubbish somewhere – the kind of random rubbish that makes programs go pop. STL had simply moved the furniture around and my code had tried to sit on the sofa at the old position whilst carrying a tray of priceless Fabergé Eggs. Reallocation invalidates all the references, pointers, and iterators referring to the elements in the sequence. It is guaranteed that no reallocation takes place during insertions that happen after a call to reserve() until the time when an insertion would make the size of the vector greater than the size specified in the most recent call to reserve(). … but, well, I’d forget I’d done that and one day the application would have more objects than I’d reserved and cryptically crash again. Then I’d lose another couple of days as a result of mixing and matching the way things had been done. This entry was posted in Software development and tagged C++, cobra art, debugging, long post is long, programming standards, stl, stupid mistakes. Bookmark the permalink.